Do NOT combine this author page with any author page that includes Aldiss and another person. ONE author or combination of authors per page, please! The Octavia Books Science Fiction Books Club will discuss "The Pastel City" by M. John Harrison, which is is collected in Viriconium with three sequels, for the second of three discussions on the theme of "The Dying Earth." And, for February, the final discussion on this theme, we'll be discussing Hothouse by Brian Aldiss. Brian Aldiss is an English author of general fiction and science fiction, greatly influenced by H G Wells. He saw action in Burma during WWII, which influenced several of his books. After the war he became a bookseller in Oxford and wrote short pieces for science fiction magazines and a bookseller trade journal. His first book, about a sales assistant in a bookshop, was published in 1955. He has also edited a number of anthologies. 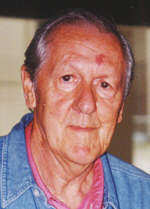 Brian W. Aldiss is currently considered a "single author." If one or more works are by a distinct, homonymous authors, go ahead and split the author. Brian W. Aldiss is composed of 60 names. You can examine and separate out names.